This is a state-of-the-art market neutral long/short equity strategy based on the Dow stocks. Signals are generated after the close of each trading day and profit calculations are based on the change from the open and close of the next day. The strategy uses alpha factors calculated daily by a machine learning algorithm. A long/short equity strategy was presented in this article. In this article the strategy is in addition market neutral since at the close of each trading day three long and three short signals of equal position size are generated based on machine-designed alpha factors, also known as features, attributes or predictors in machine learning. The historical values are generated by DLPAL LS, an institutional grade version of DLPAL software. DLPAL LS takes the original historical data files of the stocks as input and creates new files with extension .pih that include the alpha factor values for each instance (row). An example is shown below for AAPL. 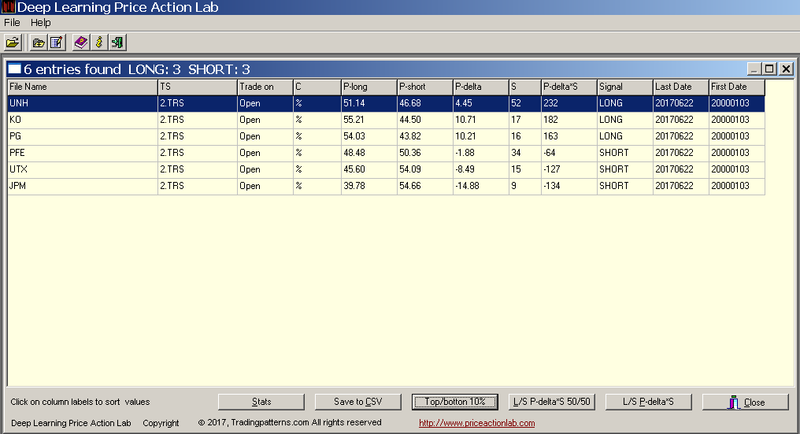 The generated .pih files for each stock are imported in a trading platform. We use Amibroker because of the ease of importing historical data with additional fields. The four indicators are imported as follows: PLong is assigned to Volume, PShort is assigned to Open Interest, Pdelta is assigned to AUX1 and S to AUX2. A typical chart of the stock with the indicators is shown below. The strategy has low drawdown of less than 7% and can be leveraged 2x to generate returns in excess of SPY total return of 21.1% in the same period. 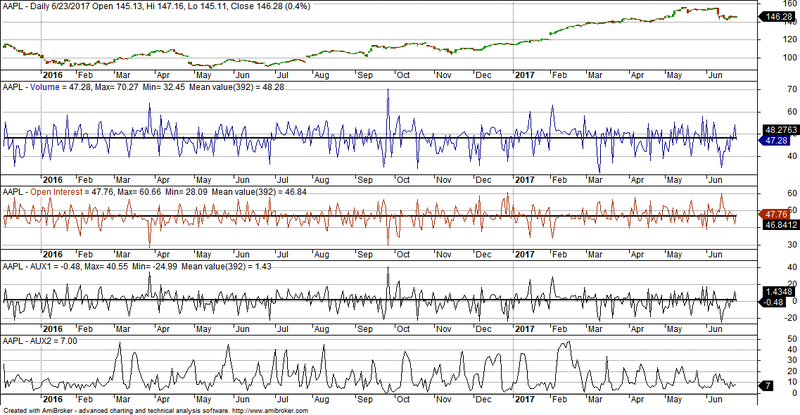 There is less than 5% probability of 10% or higher drawdown according to the simulation. The probability of drawdown exceeding 14.7% is less than 1%. A CSV file is also generated for use with an API for executing trades automatically through a broker platform. We can discuss trading this and similar strategies for long/short equity hedge funds or training in-house quants to use DLPAL LS in developing and executing these strategies.